Back in 1995, almost 20 years ago, Mike Lardy began writing a series of articles for The Retriever Journal describing his Basics, Transition and Advanced levels of his Training Program. That collection of articles, with the effort of one of Mike’s clients, Marilyn Fender, became available as a volume of photo-copied articles. It was a wonderful written description of his procedures and advice. Mike has a concise and accurate style of writing coupled, of course, with a guy who can “Walk the Talk.” Even though Mike produced a video with YBS media (Total Retriever Training) that illustrated his training, the written articles became a very valuable reference guide and study manual. 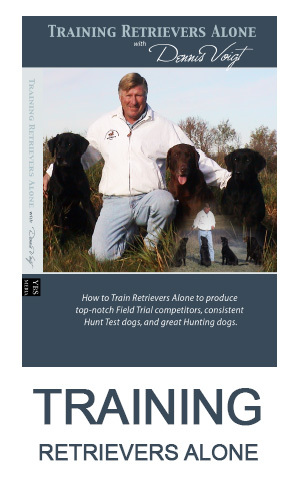 Even after Total Retriever Training 2 came out with a much revised content and new footage, I still recommended Volume 1 to every newbie (and some not so new!). It was/is simply the bargain product of the Sport. I think it used to be about $25 but even today you can get it for $29.99. Well, Mike didn’t stop there. He continued to write a series of articles that contained much “nuts and bolts” information on how to train retrievers. Gradually, his articles started to include more content about principles and philosophy, something that many gloss over until they discover that is the real substance of training. At the same time, Mike dealt with a lot of problems and their solutions but he also talked about topics like e-collar usage, pressure, attitude, sensitive dogs, nationals and so much more. Volumes 2 and 3 were produced covering the periods 1999-2002 and 2002-2005. Just recently, Volume 4 was released. It covers the articles written from 2005-2008. The really good news is that all the first three volumes have been completely updated and all have been reprinted in a much higher quality reproduction. Each now have coil binding with glossy heavy stock colour covers. The updates come largely from some later notes made by Mike for the Retriever Journal. When it appeared that Mike was going to stop his series, the editors of The Retriever Journal (Steve and Jason Smith) convinced Mike to reprint some of his earlier writings but to add updates on how and if he would do things different ten or more years later. These updates have now been incorporated into the earlier volumes giving us rare insight into how the game changes and how the top professionals change and adapt. So we now have a mini gold mine of information that can’t be paralleled for the price. Each volume sells now for $29.99 but YBS Media is offering a bundle sale right now that if you buy three, you get the fourth free. That means you get each volume for only $23. 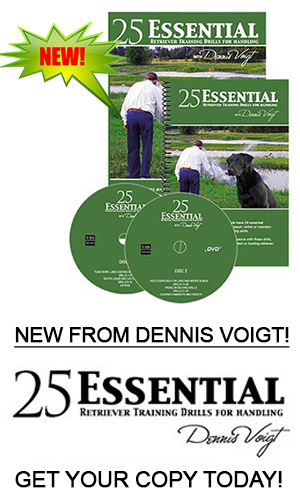 Even if you have some of the old versions, you would be well advised to gather up the complete set. Even if you are one of those people that do not learn best from reading, there is so much to be gleaned here even with a casual read. You can visit www.totalretriever.com for information on all of Mike’s educational materials. You can order the Training with Mike Lardy Articles Volume 1-4 from www.ybsmedia.com.